Imagine this scenario: you walk to your car early enough to arrive at work just on time, turn the key over, and hear… nothing. You do it again, then remember something you were told about flooding the spark plugs and realize your battery must be dead. This has happened to almost every driver but don’t worry – learning to jump start your car is easy. Just follow these basic steps and rules about safely jump starting your car, complements of the service center at Chevrolet Center. To jump a car, you’ll need a friend or a kind stranger with a functioning car. Their car will be the source of power for yours. You’ll also need jumper cables, which you should keep in your trunk at all times for emergencies like this one. Have your friend or neighbor move his or her car so that its front end is facing yours. You’ll want them close enough that the cables will reach, but at least two feet apart. Put both cars in park (or neutral for manual transmissions) and turn on the emergency brakes. Turn off the functioning car and open the hoods of both cars. Use the Owner’s Manuals to locate the battery of each car. Each battery has two terminals, positive and negative, which are often painted red and black, respectively. Make sure that you have correctly identified the terminals on both batteries, as this step is extremely important to a safe and successful car jump. Place the positive cable (red) on the positive terminal of the dead battery. Next, place the other end of the positive cable on the positive terminal of the functioning battery. Now connect the negative (black) cable to the functioning battery’s negative terminal. Take the other end of the negative cable and do not attach it to your battery. Instead, clamp it onto an unpainted metal surface of your car, away from the battery. Turn on the functioning car and give it a couple of minutes. Now you can try to start your car. If it starts, leave it running and disconnect the cables, starting with the negative cables. Do not let the cables touch at any point while any of them are connected to the cars. Let your car run for a while so the battery can recharge. 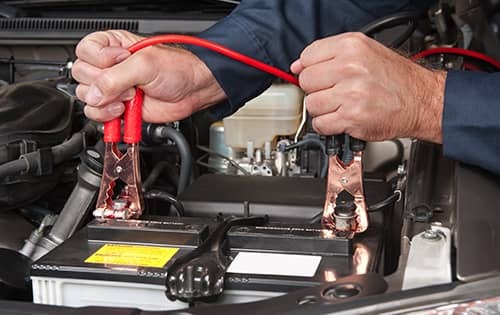 If you follow these simple steps, you should be able to jump start your car, but a jump is usually a temporary fix to a more serious problem: your battery is likely going to need replacing soon. For more information on batteries, contact or visit Chevrolet Center at any time and we’ll be glad to help!